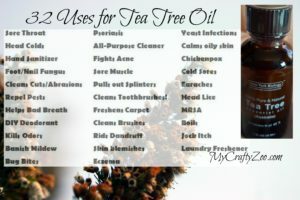 If you haven’t tried New York Biology Tea Tree Oil, now is the time! There are so many awesome uses. I can’t wait to try them all and see which ones I’m over the moon for! You can also check out my 36 Uses for Lavender Oil and 21 Uses for Sandalwood Oil! I’m new to the world of oils so I’m enjoying learning so many different uses!